We wrapped up our stay at Hunting Island by driving through Beaufort one more time. We had planned to take the ferry from Cedar Island to Ocracoke then a second ferry to Cape Hatteras, driving up the cape to Kitty Hawk. But stiff winds and predicted swells of 8 and 10 feet for the morning of our crossing changed our minds. It is a two-hour sail for the first leg and a twenty-minute cruise for the second ferry leg. Our concern was having the first ferry delay, not to mention our own discomfort on rough water. So, we bailed on the idea and drove up the coast instead. We really wanted to get to Kitty Hawk for an overdue reunion with our long-time friends Fred and Nancy Anton. The visit was relaxing, the weather was perfect, the stories and laughs genuine. Jim and Fred continued a competitive golf match that has gone back and forth over the years- this time Jim was the victor! While the guys went shot-for-shot on the course, Nancy and I enjoyed the beach. Lovely soft sand, green-blue water with good sized waves breaking just off the beach. But that beach is in jeopardy of washing away. 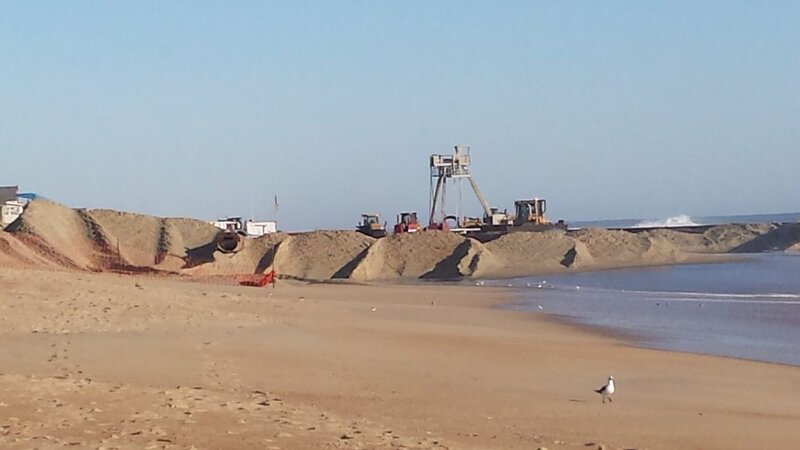 Erosion has taken its toll on this barrier island and a "beach renourishment" project was in full swing across the street from their vacation house. A barge offshore brought sand pulled from the ocean bottom a few miles away and then pumped it through a pipeline to the beach where it spewed out like a fountain. Three, specially-outfitted bulldozers moved the new sand into dunes along the shore and then smoothed and stretched it down to the water's edge. That night in the RV, Jim and I fell asleep to the sound of heavy surf and bulldozers. It turns out the bulldozers and barge work in tandem 24 hours a day. The next morning, I walked down the beach to watch at close range and talked with one of the home owners there. They were grateful for the work and didn't mind the noise and bright lights all night long. That "noise" meant their home was being secured against the tide. The noise and lights didn't bother us a bit either. It was good to know this favorite beach spot would live on for a few more seasons. When the guys returned from their golf match we enjoyed a leisurely conversation over great food. Meals with friends always taste better but especially so when the veggies are fresh from the earth. Nancy's sister owns a farm in New Jersey, so fresh veggies were on the table. I had forgotten how delicious Jersey tomatoes and corn could be! Jim and I indulged in tomato sandwiches early in our visit, and Nancy generously packed up a few tomatoes for us to take along on our journey. With the sun shining and breeze blowing, we said our good byes and pointed the RV north for the next leg of the trip. This time to visit my brother Glen and his wife Annette in Maryland. The traffic was remarkably snarled from Richmond to Washington, D.C. slowing to a snail's pace in many places. What should have been a four-hour drive turned into a six-hour bumper-to-bumper marathon. When we finally pulled into my brother's place we were more than ready to get out of the vehicle and walk around. Always gracious hosts, my brother and his wife were ready with a glass of wine and a tour of their lovely gardens. The summer rain had been plentiful creating a thick, green carpet surrounding the house and flower beds. We strolled around the property admiring some favorite and some unusual plants and trees. The cool evening and empty glasses chased us inside, while we talked about other gardens they have visited. Annette retrieved several garden books from a stack on their coffee table tempting us to find a few places to visit on our trip. 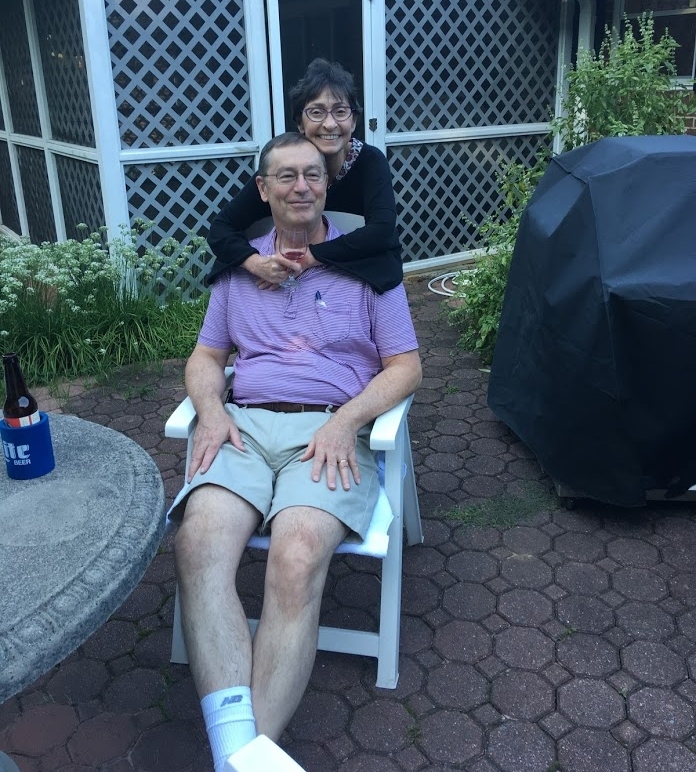 Glen and Annette are well traveled and offered a number of suggestions for public gardens and museums in the D.C. area and along our route. Great opportunity to get the RV on the water! As we talked about our trip and next stop, Glen suggested we take the ferry from Lewes Delaware over to Cape May New Jersey. Having missed our ferry trip to Kitty Hawk due to bad weather, we were delighted to get another chance to take the RV on the water. It is good to have local guides to help find the best things to do in the area! A relaxed supper and a lot of laughs took us through the evening. Glen treated us to a stay in the hotel he manages and we gratefully took the opportunity for long showers and a breakfast buffet. Morning brought the end to our visit - too brief, but a wonderful reminder of the pleasure of reconnecting with family. Next time we visit we will plan on exploring the nation's capital with these two knowledgeable guides.